I've been wanting to do a link up for a while now...and I thought what better to discuss than our love of summer? I'm calling this "summer style" because I have a thing for alliteration, but also because I think everyone's summer has a bit of a different style to it. I look forward to wearing no makeup, running around barefoot, and listening to music and/or reading by the pool all day. Basically, you can add your link to the widget at the bottom of this page, and then, on May 24th (it's a Saturday), you can tell all of the blogger world about your favorite way to "do" summer, essentially, your very own "summer style." You can talk about your summer playlist and your favorite songs that always make you thing of summer, OR your favorite summer vacation, OR your favorite things to wear and places to shop for summery clothes, OR your favorite recipes to make during the summer, OR anything you want! I'd love to incorporate everyone from lifestyle bloggers, to fashion and beauty bloggers, to mom bloggers (because yes, reading mommy blogs is my guilty pleasure! ), so please share and invite all of your bloggy friends to join in on the fun! 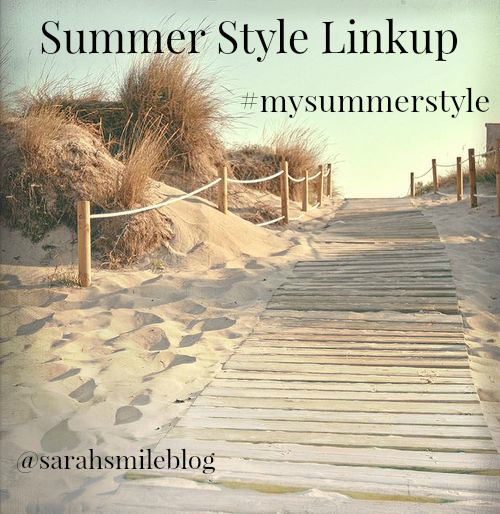 Let's make the rule of the day that when you hash tag your post on any form of social media you use #mysummerstyle and we each check out two other bloggers! That way, we can "meet" two lovelies we may never have met before! Also, please let people know when you blog that day that they can still participate even if they didn't link up here before…just tell them about the hashtag so we can find their posts! Can't wait to read all of your awesome posts, see ya on May 24th! YAY! Marked my calendar. Such a fun idea. Thanks for including me. Yay! Thanks for participating! Can't wait! I'm so excited to join in!